When we started to dabble with organic farming in 2006 we envisioned the potential lifestyle of an artisan. We were choosing a micro scale of specificity and specialty growing which could produce truly epic products. We championed ourselves as the new “cool” of vegetable nerds. Today this would be described as “hipster.” Hell, I’ll own up to it. Todd Schriver (now co-owner of Rock Dove Farm) and I were the weirdest, most cantankerous pair of food connoisseurs this side of Brooklyn. We came to vegetable farming through our work and friendship in the new world of artisan cheese making. Todd went to Vermont in 2005 to study with Woodcock Farm, an excellent producer of raw sheep milk cheeses, and I was finishing my time at Curds and Whey in the North Market. By the fall of 2005, I had tasted more than 600 cheeses. My palette had graduated with a PhD in terroir, seasonality and regionality. While I wanted to start a restaurant that I could share my sense of place, I was also being pulled back towards the rural life of production through cheese making. And I couldn’t just own a cheese shop or have a restaurant. That wasn’t authentic enough. I wanted a pastoral existence, something simplistic. I love that time of our journey which helped foster Wayward Seed Farm. We were ambitious and mildly arrogant about our ability to produce great foodstuffs here in Ohio. Couldn’t we just change the quality and joy people had with food in our community? Baby Swiss, fruit wines, and trail bologna needed to go. We can do cool stuff here too. Someday, my grandkids will enjoy a well-aged wheel of blue cheese and some sparkling hard cider that was made right here in our community. It won’t be a choice of snobbery or elitism; it will be a daily celebration of who we are as Ohioans. It will be our culture, our pride, achieved through a dedication to excellence and ethical business practice. I had a vision of our future, and in 2006 we started Wayward Seed Farm as the small embodiment of these values. I could see a day when people would start to slow down enough to enjoy their food in the same spiritual way that many older, established food cultures of the world do today. It’s like that first ear of corn you eat in July and when you go back to the kitchen to get another one or when you see kids spitting out watermelon seeds at an August picnic. We committed ourselves to this vision and its infinite possibilities. This preceding passage gives one much insight into the intoxicating beauty of the food movement and more importantly exposes the naïve nature of 25 year olds. It takes a lot of moxy and stupidity to become an organic farmer. As many of you know, I’m a risk taker and I would move mountains to see this reality come true. That’s why Jaime and I started our CSA program. We were brought into the CSA world by our friend and fellow farmer, Sandy Sterrett of Elizabeth Telling Farm in the fall of 2007. She asked us to provide a fruit share for her existing CSA members. We had strong connections to the fruit farms in Sandusky County where Jaime and I grew up. We brokered the fruit share with great results and decided to dive into our own vegetable CSA in 2008. We started with about 60 members that first year. Many people ask why we took on a CSA based on its difficulty and need for maximum diversity of products. We started a CSA because it was a necessity to build a farm and company from extremely humble beginnings. Our first plot in 2006 was an acre that my boss at the time let me use rent free. We had a rototiller, some hoes, lots of Rubbermaid containers and a small drip irrigation set up. Todd and I started our first transplants on my mother‘s back patio, to her chagrin. She loathed the mess we made every Friday night after harvest and the swamp we made of her yard from all of the washing. You can understand the nature of this business very quickly. To make a living, to employ workers, you must scale your business and solidify production systems. Todd and I were having a blast growing over a 100 varieties of heirloom tomatoes and trialing odd vegetables like salsify, but Jaime set us on a course for business success. Her education and experience in hospitality management immediately forced us to think more professionally about the venture. She thought of things like marketing materials and packaging for our products. As passionate as Todd and I were about growing the food, Jaime was equally passionate about creating a brand that meant integrity. This brings us back to the choice of CSA and its meaning to our operation. We actually became a business because of the CSA program. Jaime was able to leave her job at the time to run our administration and distribution operations. Todd and I acquired more equipment and expanded our acreage markedly. Additionally, Jaime founded several farmers’ markets in town to expand local food’s footprint in the Columbus area. We found a stable market and financial funding mechanism in our CSA program. CSAs have and will continue to be the centerpiece of the local food movement. Customers want convenience, value and quality in their sourcing of local, authentic foodstuffs. We hope today’s investments will foster a successful future for consumers and farmers alike! Today, I am pleased to say that my personal legal issues have been resolved. I can continue to work on our farm now and in the future. My actions hurt many, especially my family and close friends. I chose not to speak about these issues publicly due to its sensitivity, and because of the severity of its potential repercussions to my freedom. I am sorry that my actions jeopardized our ability to fulfill our CSA obligations to you, our membership. I love to do this work; it’s my life’s work. Sometimes I have been too frustrated by my failings as a farmer and a person. Organic farming’s ethics are about failing just as much about succeeding in the early years. It’s hard. I returned to work this past September and simply spent all my time at the farm or my home, without distraction. I was afraid to face people out of shame and fear, mostly because of the intense publicity of my legal charges, and so I chose to isolate myself to a small group of family and friends. This had a negative impact on my social relationships, but allowed me to recommit my efforts to the farm. I hope you’ll agree, we had a fantastic fall season! I worked hard every day to maintain those Honeystick carrots, broccoli, Lacinato kale, and other fall specialties. I slowly regained more confidence by working around our work share members whose dedication and support really made me feel better about myself. At Wayward Seed Farm, we harvest and deliver more than 250 CSA shares each week for 25 weeks per year, in addition to a robust farmers market and wholesale schedule. We have developed “work shares” because we want to give our members the opportunity to be involved at a much deeper level on “their” farm. A “work share” is the exchange of labor for a CSA share. Want to learn more? Join us at Sassafras Bakery on Wednesday, March 5th from 5-7pm. The event is open to everyone. Whether you’re a city dweller, or a seasoned homesteader, or just simply curious about local farming, please join us! Bring your questions and we’ll discuss details and specifics before making the final decision together to make the commitment. In the meantime, read more about our work share below. Work share members work together with full-time Wayward Seed Farm crew members. Our expectations are high. The jobs are physical. The work can be heavy, exhausting and repetitive; hot, cold or wet. Good physical condition is a must! Ability to repeatedly lift 30 pounds is a must. Although you may be in great physical condition, you will still discover muscles you never knew you had. You may find yourself in unfamiliar or uncomfortable positions for a sustained period of time (squatting, kneeling, stooping, bending). We work in ALL weather. A work share requires a commitment of 5 hours of work per week for 25 week term (as defined in the Frequently Asked Questions section below) in exchange for one (1) Weekly Vegetable Share with Fruit Supplement. You will commit to a shift and work that shift for the entire season. Requests for permanent change(s) will be accepted in writing and decided upon within one (1) week. Requests may or may not be approved, and decisions by Wayward Seed Farm shall be final. You will be involved in all aspects of vegetable harvest and post harvest including washing, bagging, bunching, weighing, counting, and sorting vegetables. You will weed, trellis, transplant, and mulch. Each shift has its own rhythm. There are many one-time jobs; some jobs repeat themselves week after week. No. It is best if one person in a household makes the commitment to work the shift. It is unacceptable to simply send another person in your place. Yes, morning shifts are spent primarily in the fields harvesting (but sometimes there is work in the packing shed). Afternoon shifts are spent primarily in the packing shed working with the vegetables that were harvested in the morning (but often there are outside jobs as well). With that said, our work is sometimes dependent on weather, and therefore, being flexible is the key to our success. Can two of us come each week for 2.5 hours? No. Leaving in the middle of a shift is not helpful for the farm. When does the work share begin? Can I work for an every other week share? No. The work share is a 25 week commitment as defined above, which will earn you a Weekly Vegetable Share with Fruit Supplement. No. We are working hard. The work is not geared for children. The farm will offer opportunities for families to come out and have fun. You can make up your shift. With the exception of illness or exceptional circumstances, prior notice is required. Your options will include working a double shift or two shifts in one week. Please consult with Adam Welly for more details and to get approval. No. 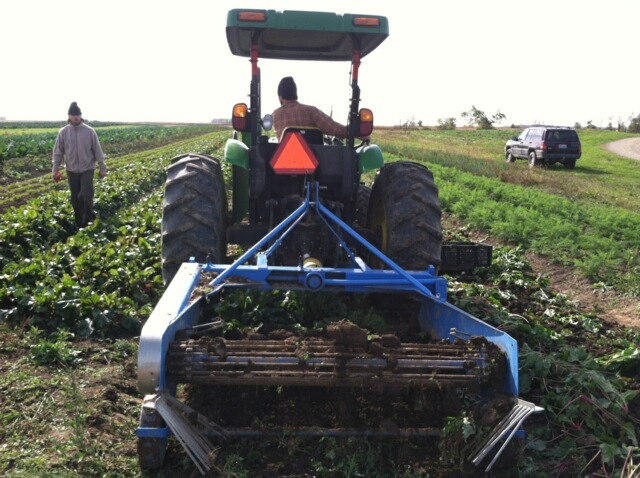 Our farm work is only performed during the day on week days. What if my schedule changes mid-season? If you know your schedule will be changing mid-season we can talk about it and plan accordingly. If your schedule changes unexpectedly mid-season, we will do our best to accommodate it. In either case you will be able to switch to another shift that fits your schedule. If accommodations cannot be made that are reasonable for us under the circumstances, your work share will be terminated at that time. No, we really need workers for the entire 25 week season. We will hold an orientation on a Sunday in late March in the afternoon, for all work shares. All family members are invited! Also, a written Work Share Commitment Agreement will be required to be signed at this time. Join us at Sassafras Bakery on Wednesday, March 5th from 5-7pm, or email us at farm@waywardseed.com. Bring your questions and we’ll discuss details and specifics before making the final decision together to make the commitment and attend an orientation. Work shares develop a special connection with the farm, farmers, and other workers, and develop an appreciation and understanding of organic vegetable production. Come join us on the farm this summer!